I recently went to the dermatologist about what turned out to be a perfectly ordinary freckle. She tool out a lens, and looked closely at every inch of my skin, making notes on a clip board before deciding that I was, basically, fine. “Though we could definitely improve the appearance of these enlarged pores on your forefingers,” she said. Almost in passing. What enlarged pores on my forefingers? I had never noticed them before. Wasn’t that just what a forefinger looked like? Back at my desk, back at my computer, suddenly all I could see my forefingers, pistoning up and down on the keys. Forefinger pores danced before my eyes, getting larger and larger. By the end of my email, my fingers looked basically polka dotted. “Are you insane?” My friends wondered. A half hour stirring a risotto, and a healthy dose of perspective later I can confidently assert, no. It is not. It’s not only the gentle stirring that makes risotto feel like kitchen therapy – radio on, or music on, glass of white wine in hand. This risotto is, in the nicest possible way, beige. It’s a very relaxing, unchallenging color, smooth, creamy, plain, almost austere, very minimalist-ly beautiful. 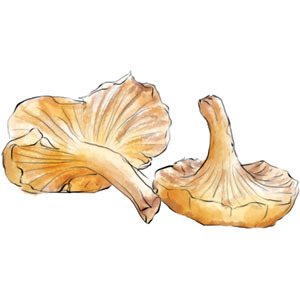 Brush the mushrooms to clean them, and slice any really large ones in half or quarters. Put the mushrooms into an oven dish with 1 tbsp of butter and a splash of olive oil. Add the thyme sprig, grate over the garlic and the zest from about half the orange (zest the whole orange and set the rest aside). Season well, then cover with foil and bake for 15 mins. Start stirring. Add stock a ladle full at a time, keep the heat low and stir it in gently until the rice absorbs it. Add another ladle full. When the mushroom timer goes off, turn off the heat, and leave the mushrooms in the oven out of the way to say warm. Keep going for about 20 – 25 mins, until the rice is soft but still has a little bite, and the stock is gone (you may need slightly more, in which case, hot water is fine). The risotto should have a texture somewhere between a fork and a spoon. Stir in the rest of the butter and most of the cheese. The risotto should become really creamy. Stir in the mushrooms, and let the risotto sit off the heat for a couple of minutes to relax. It seems strange but it makes a difference. Scatter the reserved cheese over the top, along with a little of the reserved zest. This entry was posted in Uncategorized and tagged beauty, mushroom risotto, perspective. Bookmark the permalink. OMG! I have pores on my forefingers! I never noticed before this very moment. Yeah you do. Because that’s what a forefinger looks like. Could this be the most non-problem problem of all time? My friend Ken just emailed me as he’s in the process of cooking, wanting to know if he takes out the thyme sprig before adding the mushrooms to the risotto. The answer is yes. A few leaves will be on the mushrooms, but take out the stick. This was a wonderful recipe…and don’t be scared off by risotto, it isn’t that difficult and it is soooo good. And, yes I am the the guy with the sprig question. This is a definite make again. Thanks Kate, and your pores are lovely. Now I’m worrying that my finger pores are also abnormal. Why would they even mention something like that?! This is the great joy of crowd sourcing. We’ve basically established that finger pores are totally normal. Unless you have a bunch of cash you don’t know what to do with!